See also: Dr. George S. Kinnemon, son of Dr. P. S. Kinnemon. Notes: Born in Talbot County, Md., December 7, 1809. Pupil of Drs. Poits and Samuel Baker; M.D., University of Maryland, 1833; Attending Physician, Eastern Dispensary; Acting Assistant Surgeon, U.S.A., 1865; Treasurer, Medical and Chirurgical Faculty, 1862-70. Died at Baltimore, January 1, 1877. Notes: DIED, On Tuesday, 18th instant, JOHN GRABILL, aged 1 year, 7 months and 12 days, son of Dr. P. S. and Sarah Kinnemon. The relatives and friends of the family are respectfully invited to attend the funeral this (Wednesday) afternoon, at 4 o’clock, from the corner of Pratt and Gough streets. Notes: The Funeral of Dr. P. S. Kinnemon, who died New Year’s day in the 67th year of his age, took place yesterday morning from his late residence, No. 73 East Pratt street. 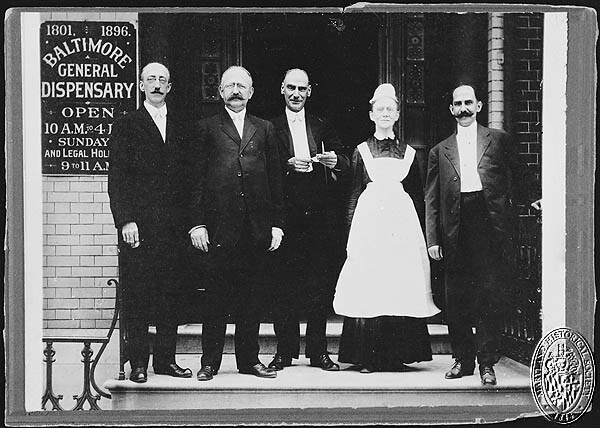 The pall bearers were Edward Lamdin, Robert Turner, Dr. J. C. Cockey, Thomas Bruscup, Dr. Hartman and William H. Mitchell. Among the members of the medical profession present were Drs. John Morris, Henry T. Rennoids, John M. Galt, C. M. Morfit, W. W. White, E. C. Baldwin and C. W. Neff. The services were conducted by Revs. J. S. Hagey and Wm. H. Chapman, of the Methodist Episcopal Church. The body was temporarily deposited in the mausoleum at Greenmount. Source: The Sun (Baltimore) 4 January 1877. Notes: KINNEMON.– On June3, SARAH, in the 71st year of her age, wife of the late Dr. P. S. Kinnemon. Due notice of the funeral. Source: Obituary, The Sun (Baltimore), 4 June 1888.